We all want to know how to save money. After years of frugal living and not-so-frugal living I have come to the conclusion that the answer to the question of how to save money is… regularly, consistently, habitually. It’s not just what thrifty tips you take on board, or how many money-saving ideas you pin to a Thrifty Living Pinterest board – it’s how easy it is to make those money-saving tips into regular, almost mindless habits. We all spend without thinking: my aim on Tartan Thrifty is to save money without thinking, to make thrifty living second nature. Because, the less effort you put into living well for less, the more likely you are to keep it up. So here is the Thrifty Habits Planner I print off and stick up in the kitchen each week – yours to download for free and customise to fit in with your life. I hope it helps you become regularly, consistently, habitually thrifty too. I find Share Something the most difficult of my Thrifty Habits to write about – because if I tell you who I have shared with it sounds boastful. I fear patronising people whose only difference from me is their current income bracket. And the fact is I don’t share nearly enough to position myself as an Arch Sharer, dispensing advice on how to do it. In truth, I focus so much on cutting our spending that I don’t often lift my head and pay attention to the greater financial needs of others. But this week this infographic from The Trussell Trust made me lift my head and pay attention to the steep rise in the number of people around me not being able to buy food. So my own Share Something effort is to stop donating as the fancy takes me and start making it a regular part of our monthly grocery budget. And to make sure that I vote on the 7th of May for a party that will at least try to cut down the number of us driven to the doors of food banks. 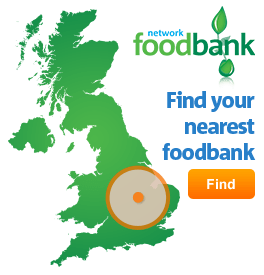 Wouldn’t it be great if, this time next year, I could post an infographic that showed the number of food bank users dropping away down? Click here to download your copy of this week’s Thrifty Habits Planner. You can look up each habit in The Thrifty Habits in the sidebar to the right for more information. Look at the Weekly & Monthly/Annual Thrifty Habits. Decide which day suits you best for each one and pencil it in on that day. When you have done it, tick it off. Pause for a moment to enjoy the little fizz of smugness this creates. Got any thrifty ideas of your own? Add them – and remember to comment about them here so I can steal them admire your cleverness. Take time at the end of the week to give yourself a little treat as a reward for your thrifty efforts. Then bin this week’s planner and come back to Tartan Thrifty for next week’s planner. I will post it on Saturday 2nd May.